Our second day we visited the castle and the surrounding park. The weather was grey and cool, but honestly after visiting two other castles in blistering sunlight I can vouch that ‘grey and cool’ is perfect castle viewing weather. Our visit to Osaka Castle was timed with an exhibit that held many letters and painted screens as well as some armor and swords from the Tokugawa era. History is always so much more vibrant when it’s right in front of you and this was certainly true here. Even though we couldn’t read the letters, seeing the ink and paper in front of us and knowing whose hand had written them was powerful. For my husband, seeing the katana and other styles of swords on display, knowing the men who had held them and fought with them, was just as amazing. Osaka Castle is a rebuilt castle so the inside is entirely modern, but this did not dampen our enjoyment of the grounds or the castle itself. 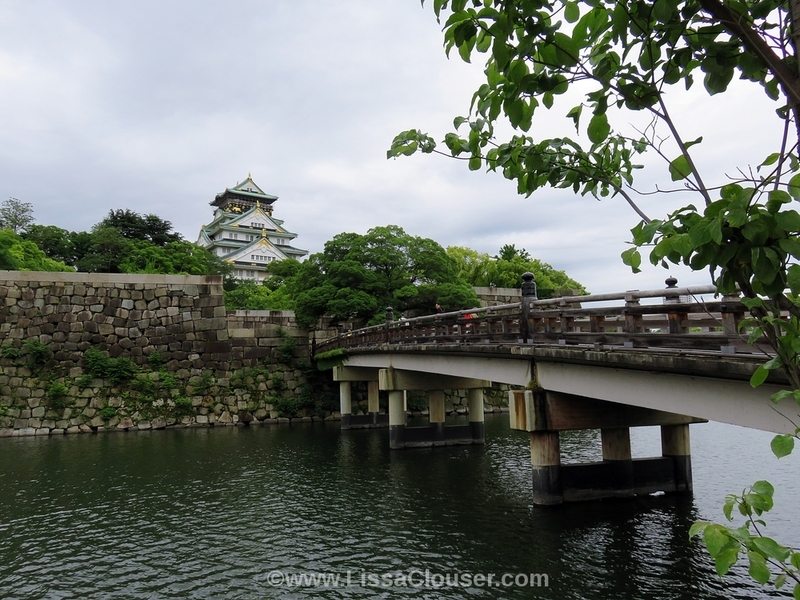 Of the three castles we saw on this trip, Osaka remains our favorite. Especially for the grounds (and we didn’t even explore all of them). On the main level of Osaka Castle Park there are food trucks to satisfy your cravings for what is most certainly lots of exercise over several hours. 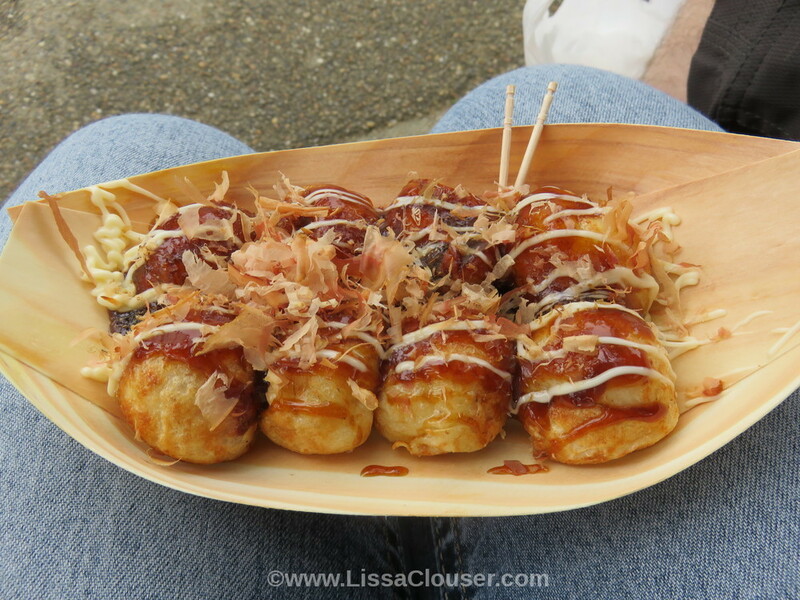 I was so happy to see a takoyaki truck, because that is one of the Japanese foods I wanted to try most! 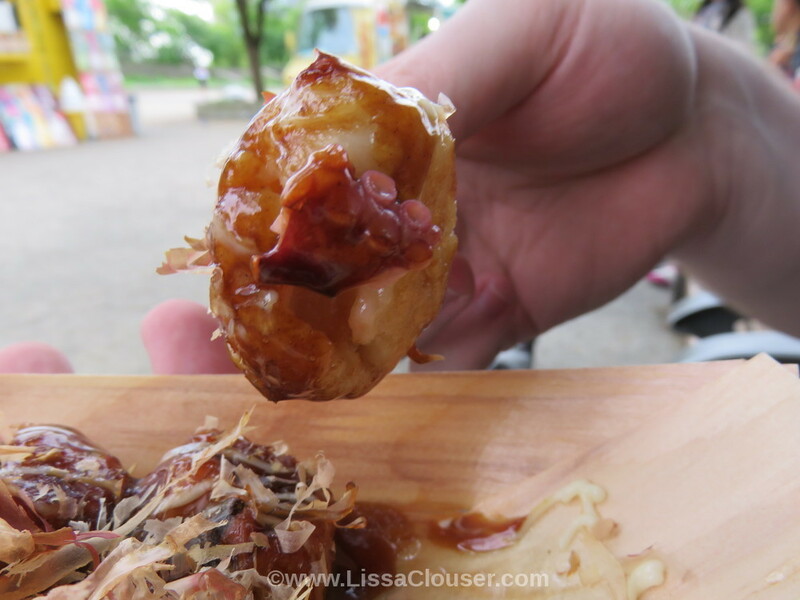 Takoyaki is octopus fried up in a dough ball with sauce (similar-ish to Worcestershire), mayonnaise, and dried bonito… at least when you get the most traditional version of the dish which is what I tried. We brought a few treats back to the hotel with us to munch on later, and this little set of jelly and custard pies did not last long at all. They might have been one of my favorite munchies picked up the entire time we were in Japan. Souvenir culture (omiyage) is huge there. Any time you go on a trip it is expected that you return with some sort of small gift, often edible, for family, friends, and even coworkers. It may not be expected in America, but I certainly came home with many such gifts for people here! 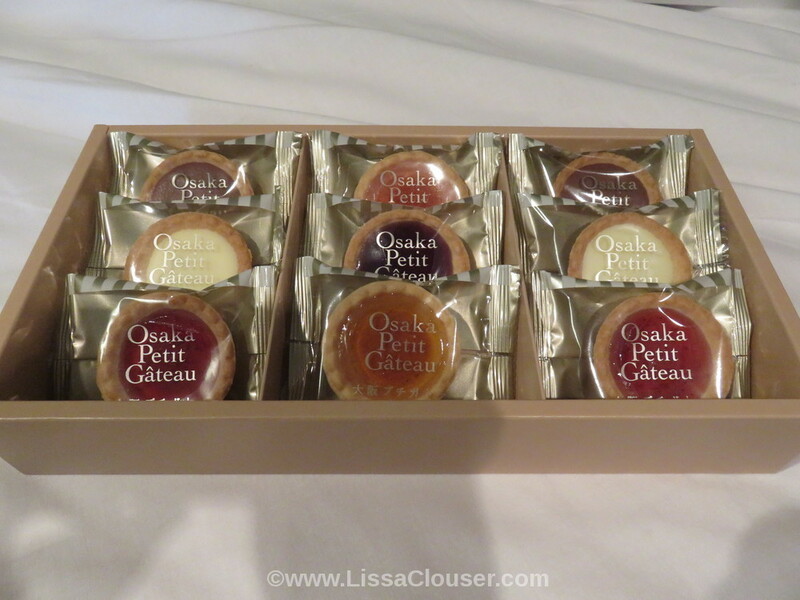 It’s impossible to really describe the breadth of omiyage options. Souvenir shops in America have nothing on this. We didn’t buy nearly as many treats as we would have loved to, all beautifully boxed and wrapped, and we still filled nearly an entire carry on suitcase, if not more, in bringing these things home. And that’s after we ate our fill while staying there! Japanese treats spoiled me something awful. But I at least somewhat expected that, remembering back to my college days when my Japanese professor would bring us all treats from her visits home. 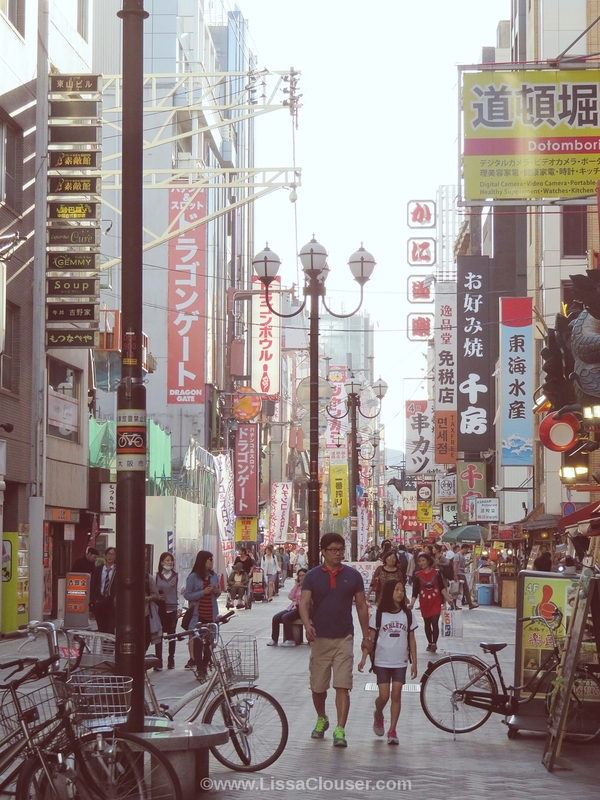 We spent another day exploring Den Den Town (of which we somehow missed one of the biggest streets) and Dotonbori. The toy and anime stories in Den Den Town are awesome, even if we did miss some of the biggest ones, and it was definitely an experience to finally be around anime in its homeland. We could have spent thousands on the figures of all our favorite characters, but we kept ourselves to bringing home just a few. My pride and joy was finding a Grell Sutcliff figure. I may have shrieked with glee inside that shop. 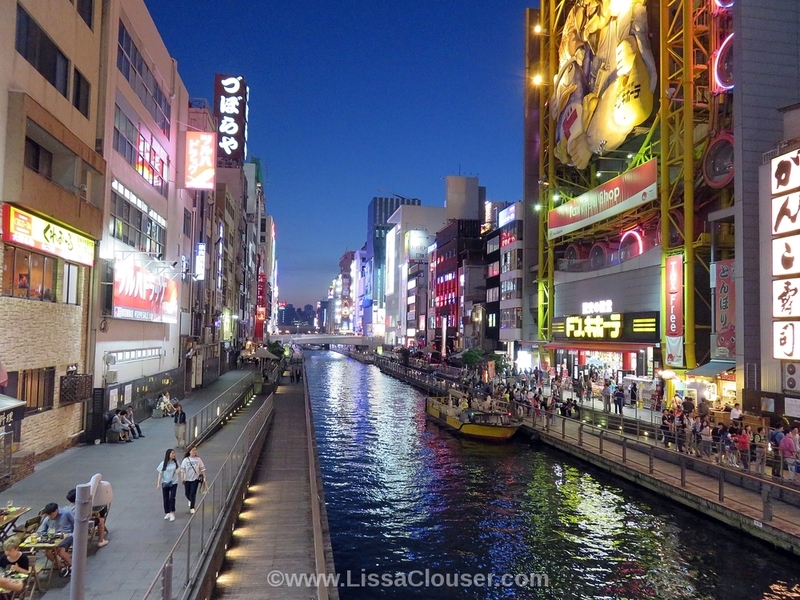 Dotonbori is… awesome. It’s the kind of place to go when you’re up for being in a crowd and enjoying the hustle and bustle highlighted by lots of lights. We didn’t spend our time down any of the shopping markets on the side streets having spent all day in Den Den already, but we thoroughly enjoyed walking by all the restaurants and seeing some of the most iconic signs and billboards. The restaurant we choose to eat at that night is probably our favorite food experience of the entire trip. We actually tried to make it back to Osaka from Kyoto on our final night just for one more meal, but didn’t quite have the energy to muster. It was a simple place with a gas grill built into each table where you ordered your own plate of meat and grilled it yourself. We chose a plate of fairly common cuts of beef, but stretched our adventure feelers by choosing one with something we don’t normally eat too: tongue. I can now say that tongue is one of the most delicious bits of meat I’ve ever eaten. With our meal we also got rice, veggies, and a bowl of seaweed soup. Seaweed soup and I go a long way back. 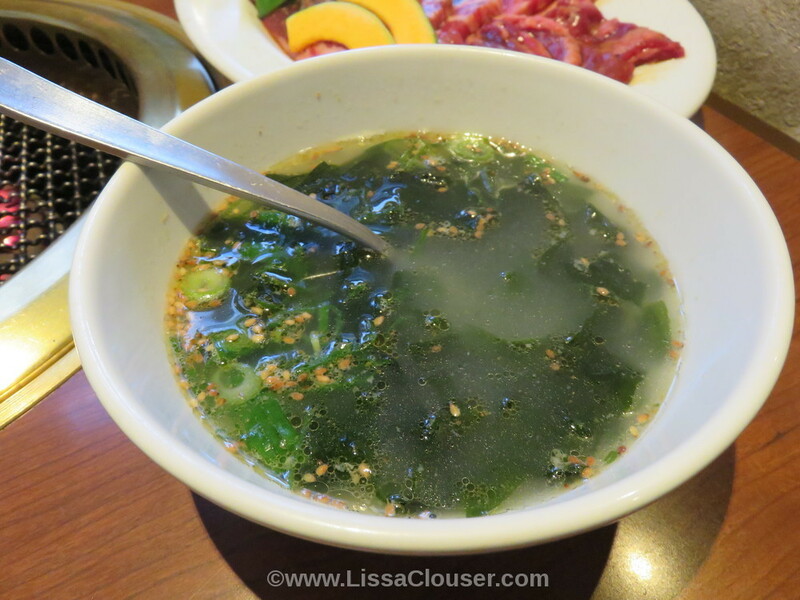 I have wanted to try seaweed soup since I first got into Korean dramas several years ago. The reason may be silly, but it spurred me on all the same. This was the very first time I finally, finally got to try real, authentic seaweed soup and it was amazing. I got to keep the bowl to myself because hubby is not a fan of seaweed, but the meal came with free beer (that never happens in America) so he was happy in his own way. With very full bellies we spent the rest of the evening walking along the canal and watching all of the billboards light up one by one as the sky got darker. Our final full day in Osaka we went to Kaiyukan, the aquarium. I love aquariums and while even visiting one here at home allows me to see species from far away, it’s not quite the same. The Kaiyukan features species from the Pacific Rim, so I got to see all kinds of fish and other animals I’ve never seen in person before. 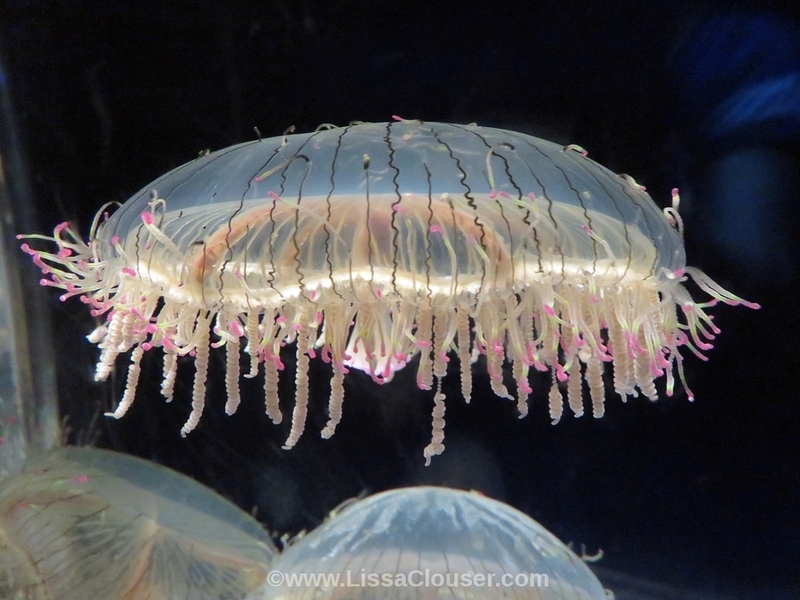 I’m a particular fan of jellyfish, at least when viewing them with the safety of glass between us, and there were so many species of jellyfish here that I’d never seen. One kind looked like tiny little mushrooms! This is one of my favorites though, as hard as favorites are to choose. 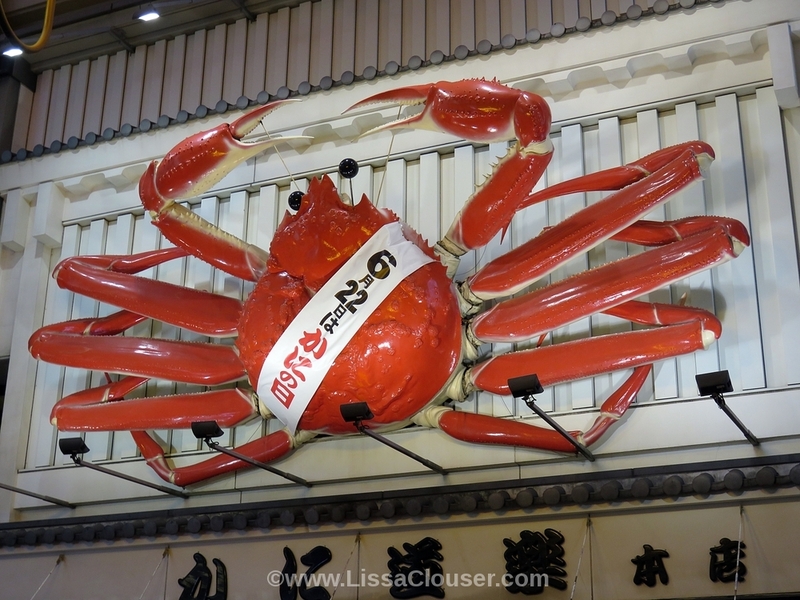 We spent the evening at the Tempozan Harbor Village mall next to the aquarium enjoying the shops. I encountered my first 100 yen store (like the American dollar store… only way better for the same price) and contained myself mostly because of the constant reminder that whatever we bought had to not only be affordable but able to be brought home! We ate Baskin Robbins ice cream outside after sunset enjoying the sea air from the harbor and ended our night with a couple of rides on the Tempozan Ferris Wheel. There are plenty of ferris wheels larger than it now, but for a short while it was the tallest in the world and either way provides an extremely impressive view. It is well worth the price and I highly recommend it at sunset. Osaka and the bay were breathtaking with nature’s fire in the sky. It’s also worth it to just sit back and watch the ferris wheel itself at night, even if you don’t take a ride. 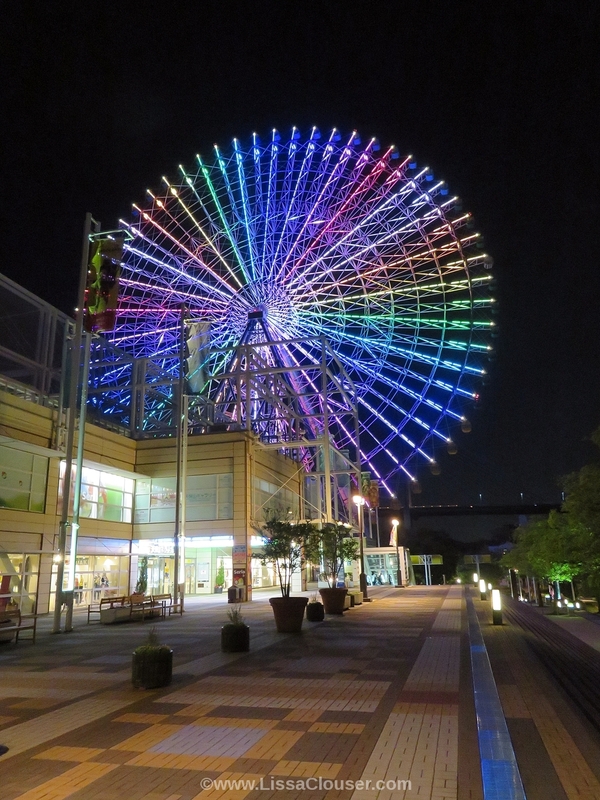 The wheel is its own light show that also occasionally has animations, tells the time, and even forecasts the next day’s weather. 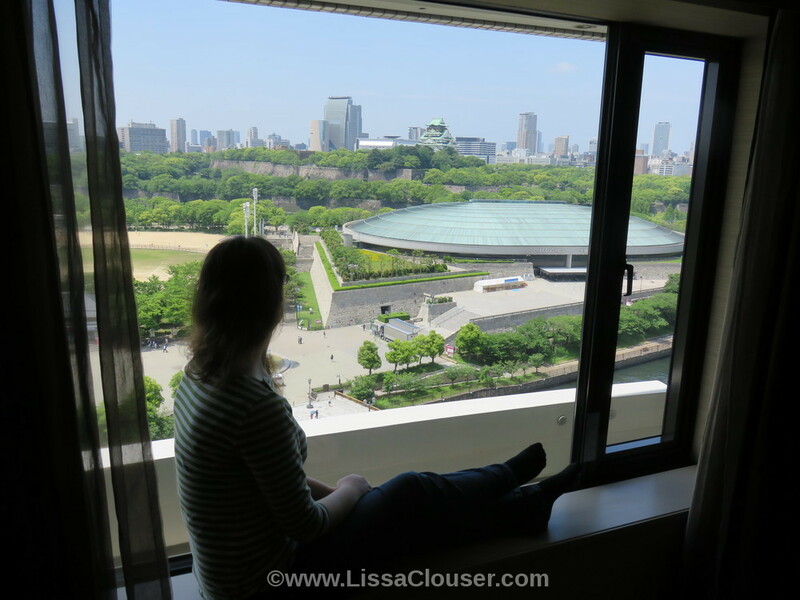 There is so much in Osaka we would like to revisit and so much we didn’t have the time to see at all, but for a first experience I felt like I got to enjoy the city and many of its offerings. After this, it was off to Kyoto!